Trends come and go as the years pass, but bathrooms consistently remain one of the most popular rooms in the home to remodel. Take a look at some of 2019’s best bathroom design trends. 1.) Wallpaper and Statement Walls. At the turn of the century, wallpaper was ruled to be outdated, but it’s making a comeback. In small and large spaces alike, an artful pop of wallpaper is a great addition to any bathroom. Adding in a dramatic, contrasting accent wall makes for a great backdrop behind a vanity mirror or a clawfoot tub. This is a great way to make your bathroom stand out! 2.) Concrete. Industrial designs are becoming increasingly popular, and the bathroom is no exception. Concrete countertops, walls, and flooring are all choices to make for a unique space. Though the material may seem cold, when used in combination with organic materials like bamboo or steel, it brings a warmness that balances out nicely. 3.) Dark Walls. In the design world, dark color on the walls was seen as a risk and is known to make spaces feel small and cramped. Recently, colors such as black and navy have been on the rise; usually used in bathroom spaces to make them feel moody and luxurious. Textured walls and tiles are popular for this type of look; boasting dark, pebbled shower floors as a highlight. 4.) White and Gray Marble. 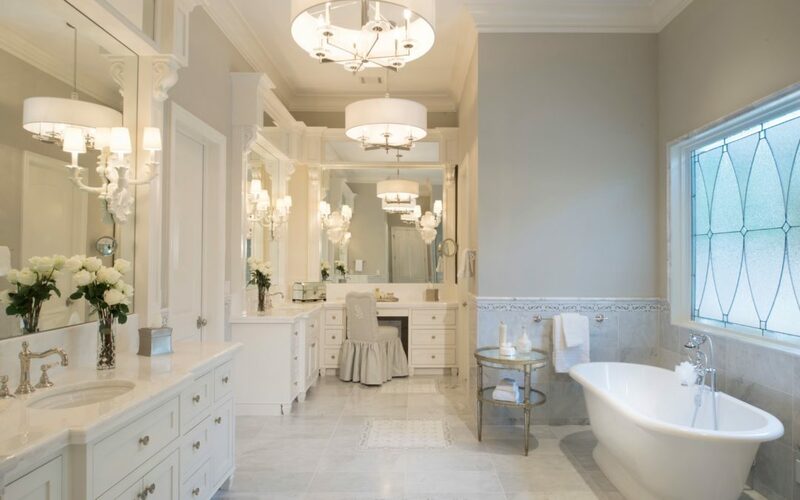 Used as an alternative to the traditional porcelain and tile for showers and countertops, trends are seeing an increase in the use of white and gray colored marble. Often used to line floors, walls, and showers, it is viewed as a subtle and lightly patterned substitute in lieu of conventional materials. 5.) Monochromatic Design. Designing with plenty of color and texture is fun, but staying monochromatic is a way to ensure your bathroom stays timeless. Choose a classic, neutral color or material that you love, and use it all around your space in monochromic fashion. To illustrate, a matching marble tile on both walls and ceiling creates an amusing box-like experience while remaining understated and in style for years to come. At Matt Powers Custom Homes, we focus on creating unique, distinguished homes for homeowners looking to bring their visions to reality. Contact us today!